June is here, and in Hermann, MO that means an exciting month of gardens, grapes, rhythm, and brews. If you like any or all of the above mentioned categories then it’s about time you visit to see what we have in store for you. We kick off the month with Hermann’s 20th annual Garden Tours and Plant Sale hosted by the Hermann Garden Club. The tours are Saturday, June 7, 2014 9-4, and Sunday, June 8, 2014 9-2; cost is $10 for the town tour, $10 for the country tour, or $15 for the town and country combo. The price of this event includes both days. Depending on which package you choose, you will take yourself on a self-guided tour around town (or a drive to the countryside) to see some gorgeous horticulture. For more information, contact the Hermann Welcome Center at 1-800-932-8687. 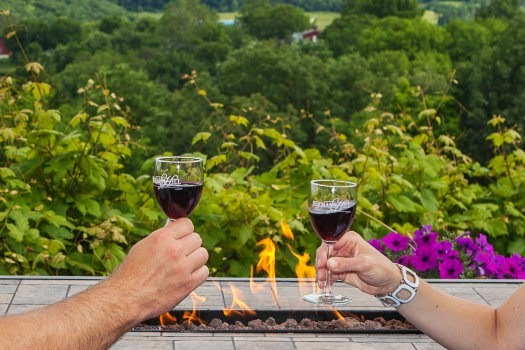 After spending an exhausting day looking at beautiful gardens in and around Hermann, it might be a good time to grab a glass of wine and relax. Saturday, June 7, at 2:00 PM, Stone Hill Winery is hosting, “Grapes to Glass,” a two hour behind-the-scenes VIP winery tour and tasting. This is an exciting event for any wine connoisseur or amateur who want to learn more about the winemaking process. Led by a member of Stone Hill’s winemaking staff, guests are surely to have an educational, factual and especially fun time on this exciting tour. The cost is $25 per person, and reservations are required so don’t wait, these spots won’t last. To RSVP call 573-486-2221. Saturday, June 8, marks Stone Hill Winery’s, “Vintage Car Cruise.” Bring your friends and check out some great antique and classic cars. There will be live music, hourly prize drawings for cruisers, and NO COVER CHARGE, all the more reason to get out and have some fun. No reservations necessary. After an exciting weekend of garden tours, wine-making, and car shows you might need a weekend to relax, but no worries, Hermann’s next unique event picks up on Saturday, June 21 at the Hermann Wurst Haus. Sausage-making 101 taught by Wurstmeister Mike Sloan is a sure-to-please event for any “foodie” or chef. Class starts at 2:00 and ends around 4:30. The $35 per person fee includes a beer and brat tasting, as well as 2 lbs of homemade sausage created by you, and a Wurst Haus apron. Call 573-486-2266 to enroll. The last Hermann event in June is sure to be a goodtime. Rhythm and Brews Festival hosted by our very own Tin Mill Brewery. This beer fest will feature microbreweries from the Midwest area with live music, food, and, of course, lots of beer! Ticket price for this entertaining occasion is $20 online and $25 at the gate. Don’t worry if you’re a non-drinker, you may purchase a ticket at the gate for $10 to enjoy the live music. Food, drink and other items will be available for purchase. So come out and visit us here in Hermann, Missouri this June and check out what we have to offer; you surely won’t be disappointed.